With a current Market Capital of approximately $1,125,841,551 and Ranked Number 15 in the CryptoCurrency Market, NEO (NEO) has recently received a technical alert as it passes once more through the 10dMA. #NEO (NEO) triggered a #dMAmapping⇗⇗⇗⇗⇗⇗ buy alert Signal on 06-May-2017 at $0.59. From triggering the #dMAmapping⇗⇗⇗⇗⇗⇗ buy alert, #NEO (NEO) has seen a staggering growth of no less than x 29.36 to the current price of $17.32. With a current Market Capital of approximately $1,125,841,551 and Ranked Number 15 in the #CryptoCurrency Market, #NEO (NEO) has recently received a technical alert as it passes once more through the 10dMA. 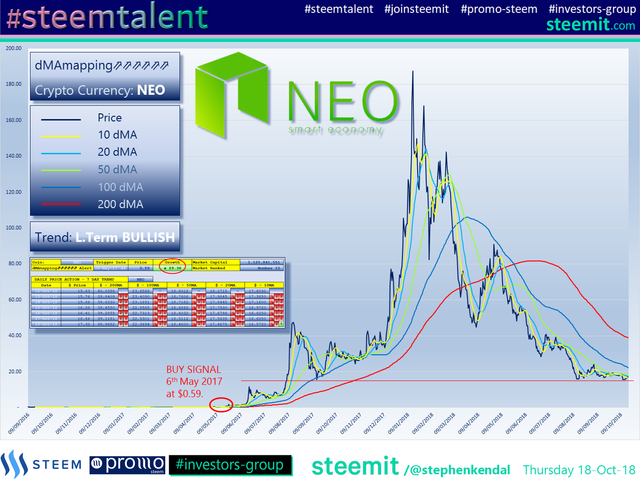 We maintain a Long Term BULLISH recommendation on #NEO (NEO) and will continue to monitor the technical analysis over the next few weeks/months. Please feel free to use the #Investors-Group tag for: Stocks, Cryptocurrencies, Commodities and Investment related Blogs. Please note that the above information is for educational purpose only and is not to be taken as investment advice. Other Cryptocurrencies are available. 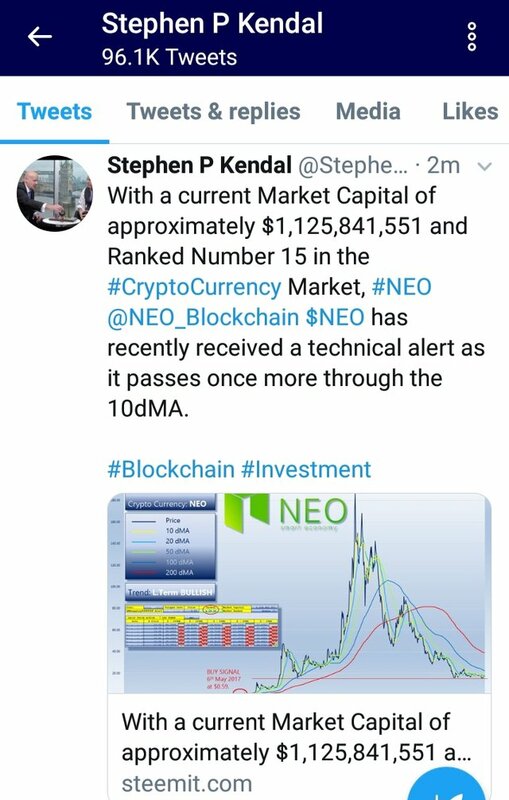 With a current Market Capital of approximately $1,125,841,551 and Ranked Number 15 in the #CryptoCurrency Market, #NEO #NEOBlockchain #NEO has recently received a technical alert as it passes once more through the 10dMA. Just Bought more NEO !